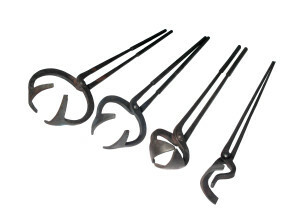 We produce the best hand forged tongs you can get! Our Typical Style 901 tongs, commonly referred to as Cat Bit or Cup tongs, are chosen here as a case study because they are one of the more difficult shapes to forge by hand. This type of tool is used in rolling mill applications, always a harsh environment fraught with safety concerns. While competitive products are occasionally welded, ours are skillfully forged from one piece of high-quality alloy bar to insure maximum strength from proper gain flow. Each tong is forged according to a print furnished for approval prior manufacturing. Our industrial tongs are available in any forgeable material, commonly of alloys such as 4140, hi carbon steel such as 1045, or a variety of customer choices including Titanium and Aluminum. Heat treatment is available when maximum stiffness / weight is important. Each forging tong is permanently marked to facilitate reorder as well as for providing complete traceability. Permanent copies of all drawings are also maintained to allow for consistent production of items ordered periodically.